Hello space fans! If something seems a little different on Space.com lately, you're not seeing things. We've got a new logo, and we recently tidied up our design a little. It's part of a broader effort to continually improve the site and amazing stories we bring to you every day. Our new logo (which you can see here) is the latest update to Space.com as we celebrate our 17th year bringing the journey of space exploration down to Earth. Earlier this month, we launched a new responsive design that greatly improved the site's look on smartphones and tablets. If you've been frustrated by our mobile design in the past, we invite you to take another look. There's an interesting story behind the evolution of our logo. Until today, Space.com had essentially three major logos since our founding in July 20, 1999. The first, which you'll see in the graphic below, aimed to "launch" our dot com with a visual depiction of a spherical dot streaking over a planet. It also emulated the historic 1957 launch of Sputnik, which ushered in the Space Age with the launch of a round, beeping satellite. 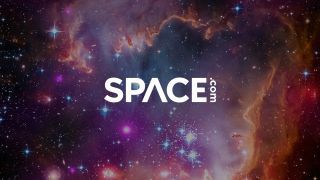 Space.com grew and changed over the years, and so, too, did the logo. The first update, a year after launch, stripped out the streak and, frankly, made the logo rather bland. It didn't last long. In late 2000, the logo underwent another transformation, into the "SPACE" over a curved horizon with a stylized "A" that was both a nod to NASA's worm logo and sci-fi fonts. That look endured - in one form or another - for more than 15 years. As Space.com and the digital landscape continues to evolve, it was time to revisit the logo. A look at Space.com's logo evolution through the years. As our creative director, Mark Hardin, explains, the "horizon" logo, while visually appealing in the right circumstances, did not lend itself well to all our needs. Think Facebook and other social media. But we also wanted to make sure that any update paid proper homage to the earlier logo even as we improved its versatility. "So with this in mind we dropped the horizon and moved .com to the end of the word mark in a vertical display," Hardin said. "We opted to keep the letter A with the lack of a crossbar representing the vast openness of space. Topped off with an update to the font that retains our bold name in a more contemporary style. All of this equates to a logo that we can enjoy in many differing formats and mediums without having to tip toe around what used to be too symmetrical an execution." Starting today, you'll see the logo on all Space.com pages, as well as in the Space.com Store. And we have more changes on the way this year to improve the content, design and experience of Space.com. So, Houston (and everyone else), we have a new logo. Stay tuned for more space-y updates from Space.com. I'll go order new business cards now.